Many millions of people are affected by the trauma of war. Psychologists have a good understanding of how experiences of war impact on memory, but the significance of external environmental influences is often disregarded. Memory, War and Trauma focuses on our understanding of the psychosocial impact of war in its broadest sense. 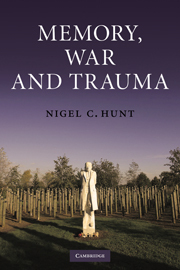 Nigel C. Hunt argues that, in order to understand war trauma, it is critical to develop an understanding not only of the individual perspective but also of how societal and cultural factors impact on the outcome of an individual's experience. This is a compelling book which helps to demonstrate why some people suffer from post-traumatic stress while other people don't, and how narrative understanding is important to the healing process. Its multidisciplinary perspective will enable a deeper understanding of both individual traumatic stress and the structures of memory. Nigel C. Hunt is Associate Professor in the Institute of Work, Health and Organisations at the University of Nottingham. I first became interested in the different ways people interpret war and the memory of war when I was a child, when I saw how my parents looked back on the Second World War with very different views. My father, who, in the RAF, was a participant throughout, tended to be neutral, not indifferent, but saw those 6 years with a mixture of positive, negative and inevitably fading memories; my mother, who was a child and adolescent, looked back with anger, seeing the war as a period which disrupted and destroyed her childhood; so I knew from an early age that people thought about the same events very differently. This book is a culmination of my thinking over the last few years: from a recognition that much of what I was taught about memory as an undergraduate student was simplistic, focusing largely on a narrow individualistic view of memory as some kind of input–storage–output device which lacked explanatory value in terms of the way memory really works; to a growing recognition that in order to understand people and their thought processes psychologists such as myself should draw on the knowledge and understanding from other disciplines, such as history and sociology, in order to develop a fuller understanding of the ways in which people think. Furthermore, psychologists can learn as much, or more, from reading a good novel as from reading the scientific literature. A narrow disciplinary focus does not lead to good science, just restricted understanding. In the same way, modularisation has had many negative effects in higher education by artificially separating our subjects into discrete areas that are perceived as having little overlap; the ‘modularisation’ of disciplines restricts the development of knowledge and understanding about whatever aspect of the world one is interested in. The title of the book gives away the foci. If we are to understand memory we must explore the influence of culture and society, and how memories are affected by the stories we tell ourselves and others – the narratives. At this level there is also a complex association between memory and history, and the ways in which memory becomes history over generations. War and trauma are unfortunately closely interlinked. Many people who experience war are traumatised by its effects (though many more are not). Most previous research into war trauma has focused on the individual effects. In this book I attempt to integrate material across disciplines (e.g. history) and across methods (not only standard quantitative and qualitative methods, but also literature and a battlefield tour) to develop a more rounded understanding of what war does to people. I would like to thank the people who, in one way or another, have contributed to the making of this book. In the first place the veterans of war. I have talked to many of these over the years – veterans of wars going back to the Second World War and sometimes back even further to the First World War – and coming forward to the wars that are still being fought. In one sense all these people share common experiences, from the boredom, excitement, fun and comradeship on one side, to the terror, horror and grief on the other. In another sense they differ greatly. People who fight in wars in different times and places are not treated the same, and the psychological outcomes are not the same. Prior to the twentieth century, few people took any interest in what happened to soldiers. Those who fought in the British armed forces in the Second World War were treated as heroes; those who fought in the German armed forces at the same time were forgotten, as were the experiences of many British troops during the final colonial period in the 1950s, 1960s and 1970s. In the USA, troops returning from Vietnam were often seen as murderers. In terms of treatment for war trauma, that has changed dramatically throughout the twentieth century, as indicated by the front cover of this book, which represents the men who were shot at dawn by the British authorities in the First World War. In modern times many would have been treated for post-traumatic stress disorder. I would also like to thank those people who have personally helped me through the long process of writing this book. Many of them were probably unaware that they were doing so, because the writing of a book is a lonely business, and getting on with real life with family and friends is very important to me, even if it does delay the completion of the book. I would like to thank my parents for inspiring me in the first place, and for being there when I have needed them; the rest of my family and the children (both now adults) Jack and Conor; my friends, including everyone in the ‘Yew Tree’, South Wingfield, and the ‘footballers’ at Lea Green on a Monday night. I would also like to thank those who have helped me along with my thoughts over the years, particularly Ian Robbins and Peter Coleman. My employer, the University of Nottingham, by enabling me to take slightly longer than usual holidays in the summer has inadvertently granted me short sabbaticals during which I write. I am also grateful to the University of Helsinki, particularly Airi Hautamaki, for allowing me several weeks of space during which I wrote a significant part of the book.